Learn about local health and wellness centers in the area and the services they provide. Every guest will receive one free raffle ticket to enter to win one of the many prizes. 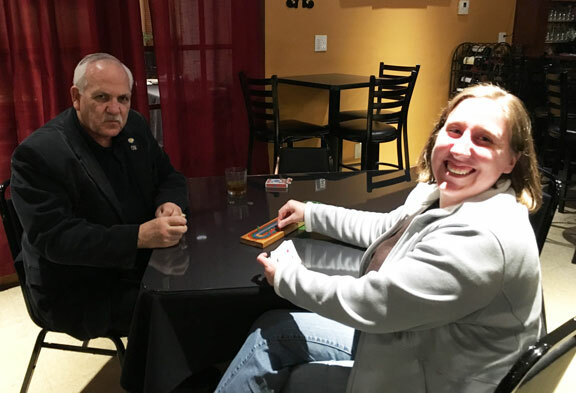 Bring a guest and receive an additional raffle ticket per guest. 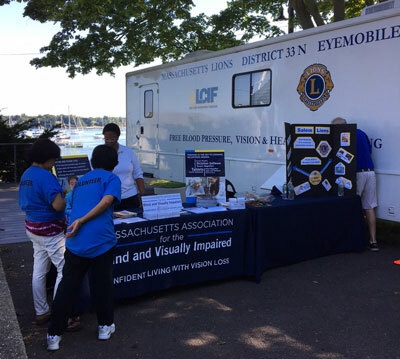 Director of Community Engagement and Giving, MAB Community Services (https://www.mabcommunity.org/) in reference to the recent Salem Wellness Fair on August 9, 2017. We had to scoot out so quickly the other day at the Health Fair because we were blocking the exit line that I did not get a chance to thank you and say good-bye properly. Chrys and I had a terrific time at the Salem Wellness Fair and want to thank you, Brian and Frank for being such great partners that day. Christine: Thank you for the original invite. We were able to give information to all of the exhibitors and many of the attendees and hope that folks will reach out to us if they need the services and support we can offer. We are grateful to have your help in spreading awareness about MABVI and thank you for being such great friends. I have attached photo we took with the mobile van. We have posted photos on social media too! 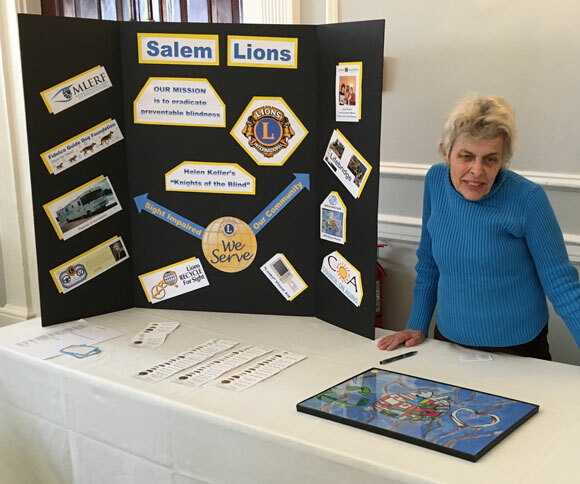 Salem Lion Christie Parker at the Salem Rotary club's non profit fair on March 28th at the Hawthorne Hotel. We were one of over 20 non-profits that attended. 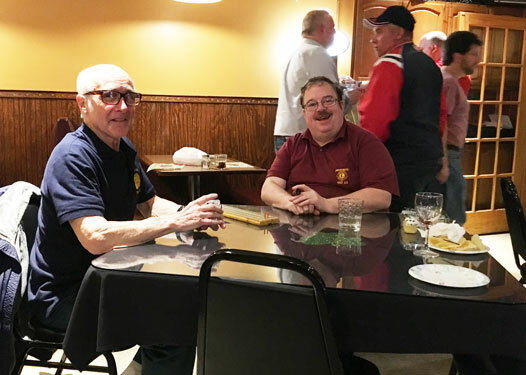 Salem Lion Chris and Salem Lion Friend Liz joined Wyoma Lions Al, Randy, Mike and Jim for their March 21st Cribbage Night. Chris and Liz did well coming in 2nd and 3rd! 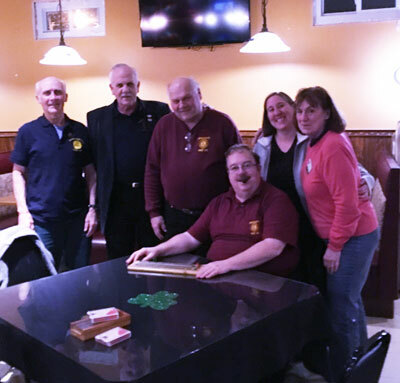 New Lion Chuck Baker, Sponsor Lion Chris Weis, Sponsor Lion Brenda Briana, New Lion Ruth Doughertry, Mass Lion District 33N 2nd vice District Governor Frank Bertolino. 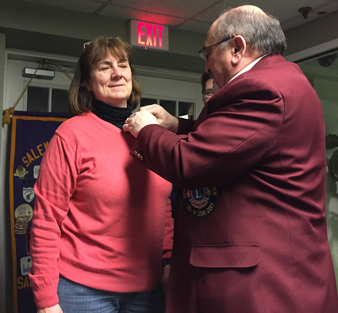 Frank presented Chris and Brenda with Silver Centennial Award pins for sponsoring new members to the Salem Lions club who have remained in the club for at least one year and a day. Great job at growing The Lions! 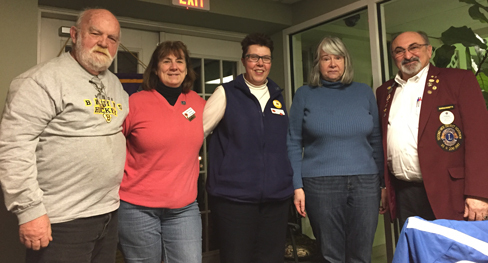 Thanks to our guest speakers Toby, Sally Reiley's husband (in the dark jacket), and Paul Herrick (in the white shirt), at Monday Night's Lions Salem Lions Club Meeting. Thanks you to all those who attended as well! We learned much about the marathon itself, the Mass Eye and Ear's mission, and their relationship with the Lions. Brenda Briana, Janae Beaver, Christie Parker, and Christine Weis. 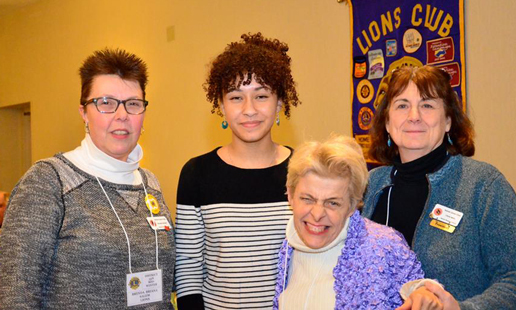 The Salem Lions are sponsoring Janae Beaver a student from Salem Academy Charter School in the 2017 Massachusetts Lions Youth Speech Competition. The 2017 topic is "Political Correctness Has It Gone Too Far". 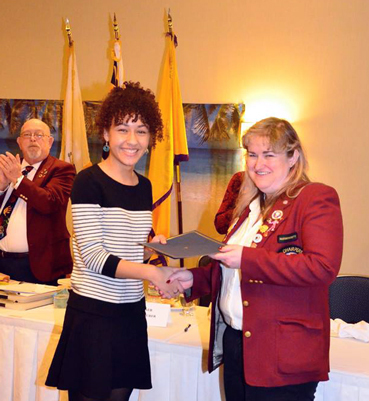 Janae was one of 5 participants in the Salem Competition held on December 5, 2016. 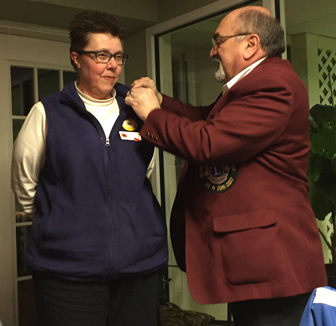 Janae competed with 3 others at the District level on Feb 4, 2017, at the Mid-Winter Lions Convention and WON! She will be competing at the State and final level at the Massachusetts Lions State Convention in Falmouth MA on May 6, 2017. 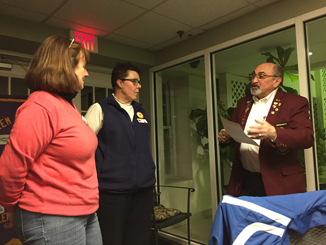 Tracy Griffin of Ayer Shirley Lions presenting the award to Janae Beaver. 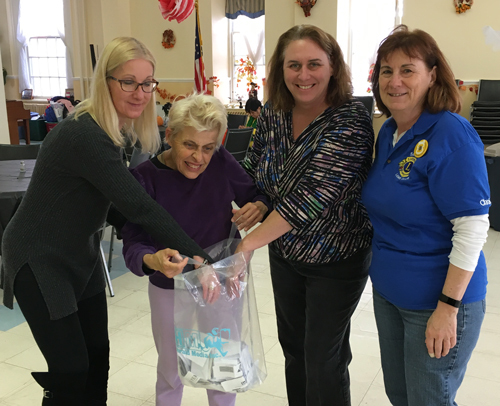 The Council on Aging Director, Meredith McDonald, and the Executive Director of the Salem Community Center, Tricia O'Brien, drew the winning tickets for our raffle on November 1st. Also here are two long-time Salem Lions Club members!